Definition at line 45 of file CCopasiObject.h. Definition at line 231 of file CCopasiObjectReference.h. Definition at line 239 of file CCopasiObjectReference.h. Definition at line 244 of file CCopasiObjectReference.h. Definition at line 255 of file CCopasiObjectReference.h. Definition at line 261 of file CCopasiObjectReference.h. Definition at line 263 of file CCopasiObjectReference.h. 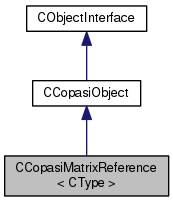 References CCopasiObject::getObjectName(), CCopasiObject::getObjectParent(), CCopasiObject::isValueBool(), CCopasiObject::isValueDbl(), CCopasiObject::isValueInt(), CCopasiMatrixReference< CType >::mReference, CCopasiObject::ValueBool, CCopasiObject::ValueDbl, and CCopasiObject::ValueInt. Definition at line 280 of file CCopasiObjectReference.h. Definition at line 279 of file CCopasiObjectReference.h. Definition at line 235 of file CCopasiObjectReference.h. Referenced by CCopasiMatrixReference< CType >::getObject(), and CCopasiMatrixReference< CType >::getValuePointer().